If you've been sewing or machine knitting sweaters for a while, you’ve probably collected quite a few scraps, swatches, and never-gonna-finish-projects. With the fabulous patchwork sweaters I was seeing last fall and the ones I'm collecting now on my Pinterest board, I found a use for my sweater leftovers. I'm inspired to sew a patchwork sweater, challenged myself to sew the makings for one, and I'm inviting you to join in. What exactly do I mean by the “makings"? Sweater blocks! Also known as sweater panels or sweater bodies, they're simply rectangles of fabric that are just large enough to accommodate one sweater piece. Sweater panels are sometimes knitted in the garment industry for cut and sew sweaters. For a person laying out the pattern pieces, blocks are so much easier to handle than yardage. Less waste too! Imagine one panel for the front, one for the back and one each for sleeves. Trims are either integrated into blocks while they’re being knitted or the trims are added later. Some of you may have purchased sweater panels from me previously when I had cable sweater blocks in stock a couple of years ago. 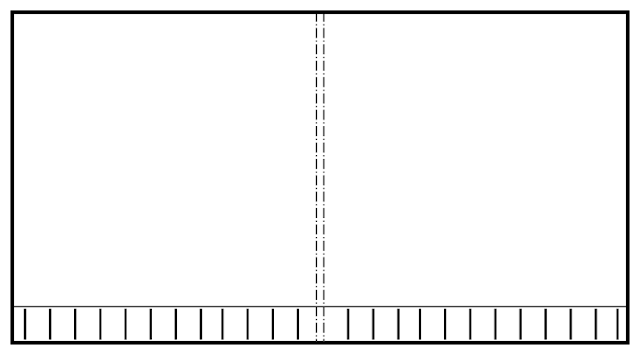 These were knitted extra wide on industrial machines, 2 panels at a time with a prominent mark down the middle to easily distinguish the panels, similar to the diagram below. A double panel like this could accommodate a sweater front and sweater back. So instead of making waste with a cut and sew sweater, the plan is to transform sweater waste into usable sweater blocks which will eventually become sweaters. Making the actual sweater is not officially part of the challenge... we’ll be on the honor system for that part! If you join in, sweaters purchased from a thrift store can also be used as panel materials. In the worksheets you're able to download, I show one quick way to cut up thrifted sweaters to yield the greatest amount of fabric without the use of a seam ripper. Remember, no newly purchased or newly knitted fabric allowed! I’ve already started the planning and I’m still collecting potential materials and imagining my design. Joining the Sweater Knit Challenge list will give you access to regular encouragement and, most importantly, access to the planning worksheets and design templates to help you in the process. If you’re on Facebook, join the Sweater Knit Sewing Group for the livestream a couple of times a week throughout the challenge. If you're not on Facebook, I'll be posting video recaps here. I hope that we can encourage and inspire each other.